Anneliese Wirth has written an article for Office.Microsoft.com about how to get used to the new user interface in Excel 2007. "The Excel 2007 Web Data Add-In makes it easy to use a Web page as a data source in Excel. The add-in plugs into Excel 2007 seamlessly, its entry point located on the Data Tab under the From Web option. The system extracts data by learning from a user's selection of data they wish to capture into Excel. The more selections, the more the system is trained. An example scenario: You wish to import and track data from MSN's weather page. Visit the site using the tool, enter Data Capture mode, and select a row or two of data from the table. Then click Select Similar, and the system will find similar data based on your previous selections. You then can click Import and leverage Excel's rich data-editing capabilities, including the Refresh command, which will revisit the Web page and extract potentially new, updated data." "Microsoft has added new file formats to Microsoft Office Word, Excel, and PowerPoint 2007. To help ensure that you can exchange documents between Microsoft Office releases, Microsoft has developed a Compatibility Pack for the Office Word, Office Excel, and Office PowerPoint 2007 File Formats"
Used Excel 2003 for spread sheets that carry macros to automate some functions. We imported information from these into an ERP system through some VBA and it worked fine. Once I opened them in 2007, compatibility mode, these spread sheet will not import and more. When opening them up after trying to import the sheets are protected! How can I fix this? DirectionsOnMicrosoft.comA couple of things to keep in mind are Trust zones and the XLSM extension. I have not tried this product, because I'm forcing myself to eat the dog's food. If you can't stand the ribbon, you might want to take a look. Bring back the Office 2003 menus and toolbars to your copy of Microsoft Office 2007. Frustrated by endless searches for features on the Ribbon? Download and install this software and easily use the familiar main menu, the standard toolbar and formatting toolbar in Office 2007, as you did in Office 2003. All new features items of Microsoft Office 2007 have been added into the main menu and toolbars. Where'd they hide that thing? Wondering where your favorite Word 2003 commands are located in the new Word 2007 interface? Or just want to explore the rich, new design with a little guidance? ... rest the mouse pointer over a Word 2003 menu or button to learn its new location in Word 2007. 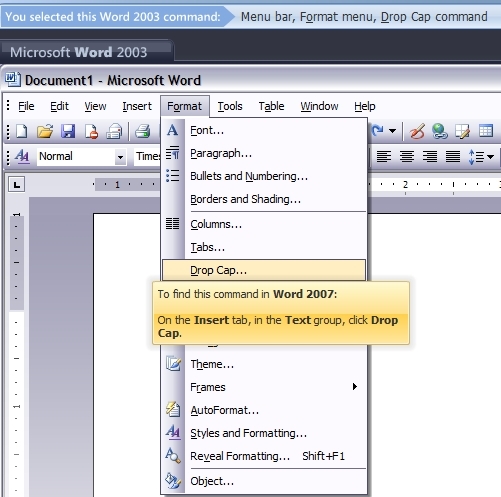 To see an animation of the location of the command or button in Word 2007, just click it. The versions above require an internet connection. Below are the links to download the guides to your machine. Download the Get Started Tab for Word/Excel/PowerPoint 2007 .
" This add-in adds a Get Started tab to the Excel 2007 Ribbon. Commands on this tab give you easy access to free content on Office Online, such as training courses, video demos, and other Office Online content designed to help you learn Excel 2007 quickly. An Office Online interactive command mapping tool, also available on the Get Started tab, shows you where to find Excel 2003 buttons and commands in Excel 2007. Office Online Community discussions are also available directly from Excel with this add-in."